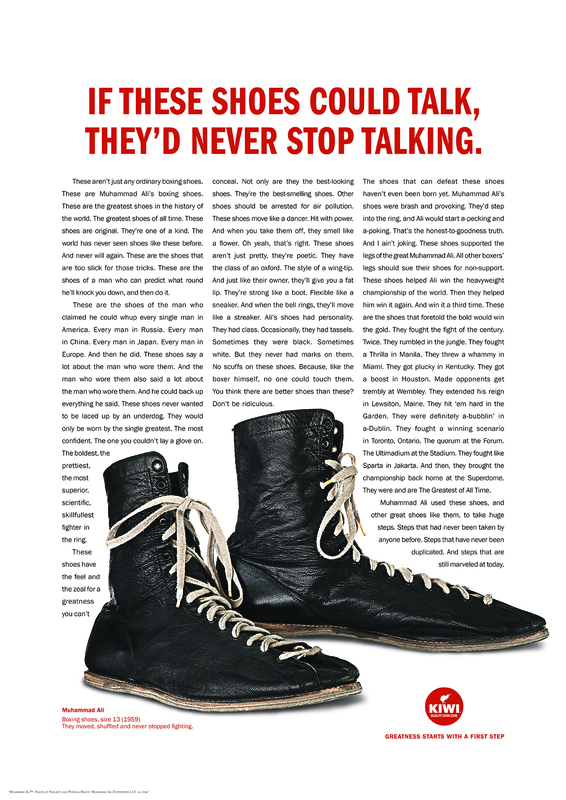 Muhammad Ali, Ernest Hemingway, Amelia Earhart and Abraham Lincoln all made their mark on history and left the world with big shoes to fill—but whatever happened to their actual shoes? 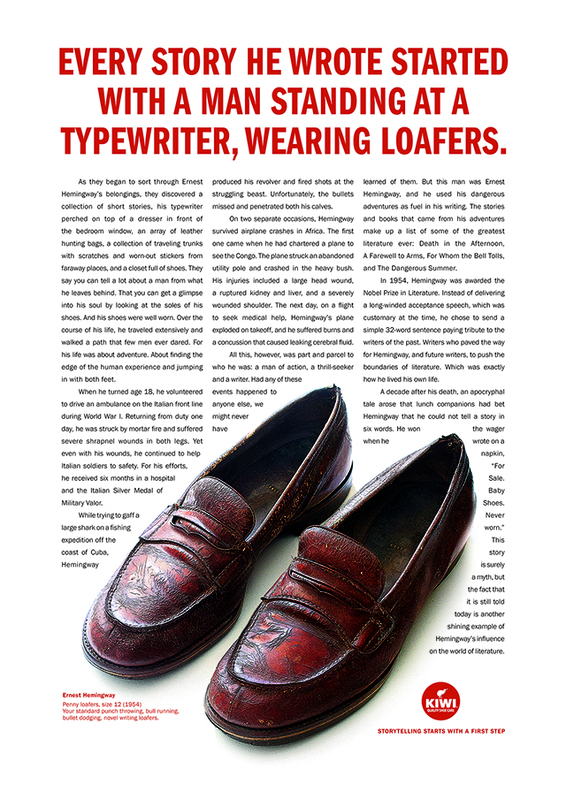 For this campaign, Kiwi sought out and photographed the shoes of six famous icons. A great deal of research and detective work went into to tracking them down and confirming their authenticity. 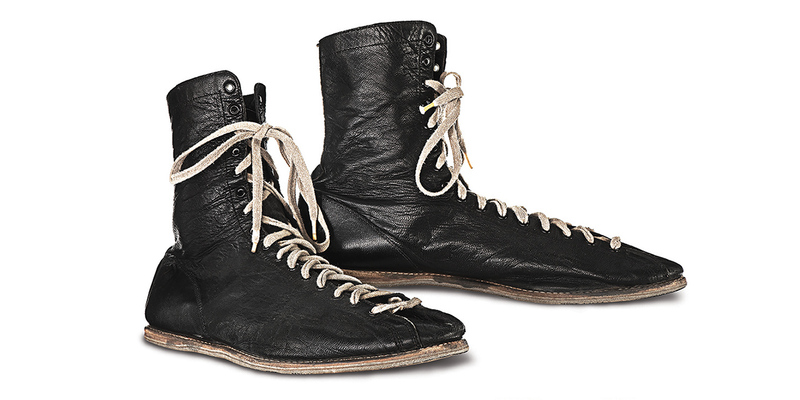 The creatives photographed the boxing shoes of Muhammad Ali, the well-worn leather loafers of writer Ernest Hemingway, the dress shoes of Amelia Earhart, and the boots of President Abraham Lincoln. 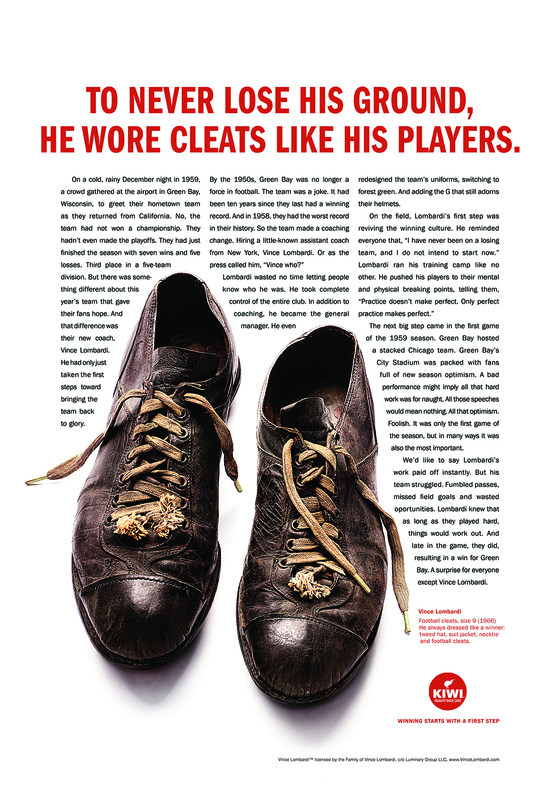 Other ads feature the footwear of football coach Vince Lombardi and nursing pioneer Florence Nightingale. “All the greatest moments in history started with a first step. 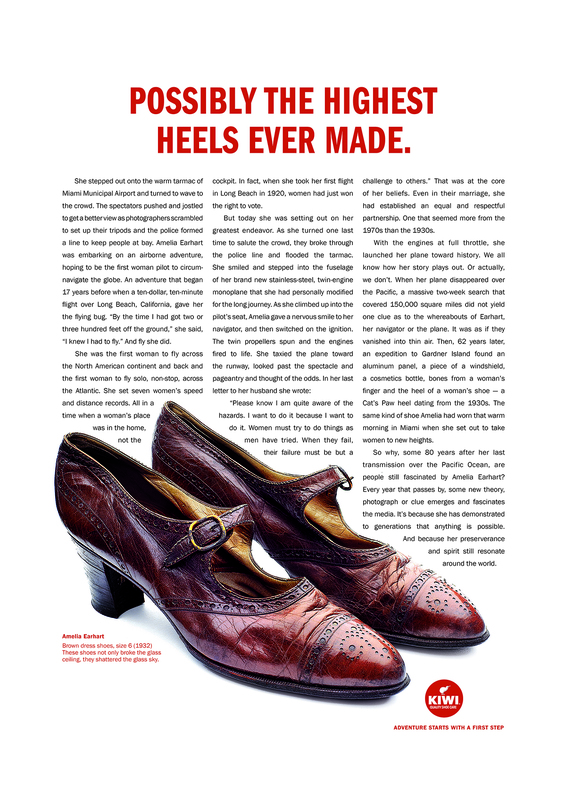 Kiwi is celebrating those moments by telling the iconic stories from the original shoes that took the first steps,” says Kelly M. Semrau, SC Johnson’s svp of global corporate affairs, communication and sustainability. The ads feature long-form copy that explore the first steps that led to these amazing life stories. 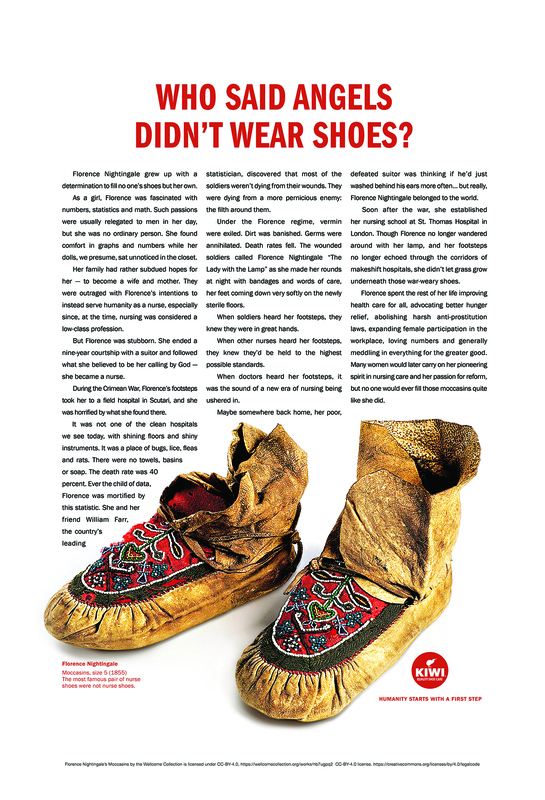 Readers learn about the storied lives of each owner of these shoes and the first steps they all had to take. The approach of lengthy copy was used to tell their stories in a rich way that would celebrate the differences these people made in the world and revolutionary impact they had on human events, Semrau says. 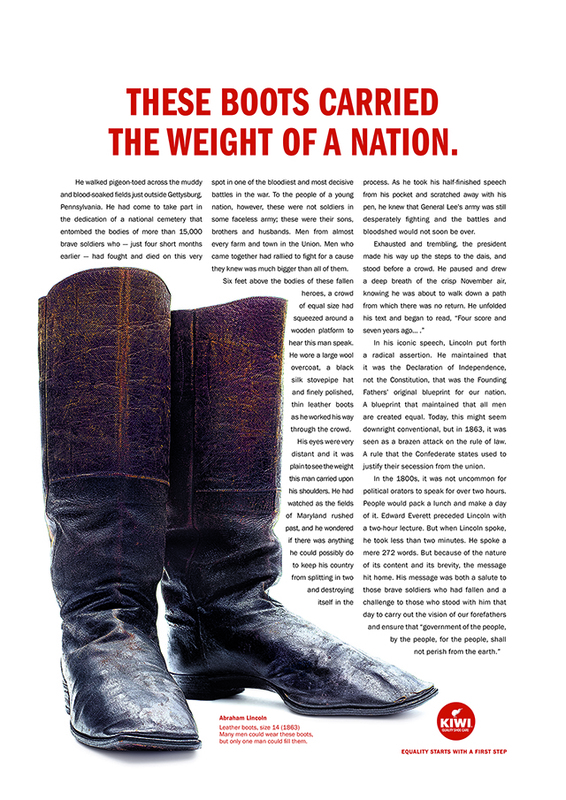 The Kiwi “First Steps” campaign is running in out-of-home, print and social. 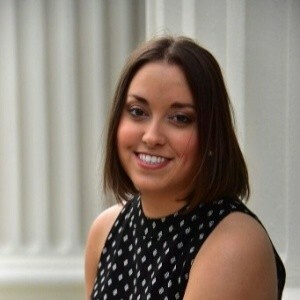 The campaign site features an audio guide that brings to life these historic moments. Explore the shoes and their journeys below. Click each ad to view a high-res version.